FactoryDirectPromo.com 2013 Custom Bag Catalog Available Now! 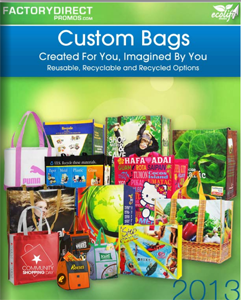 Factory Direct Promos 2013 Custom Bag catalog is here and it is full of great ideas to help you design a completely customized one-of-a-kind bag that your customers will be excited to get their hands on. FDP sells millions of custom reusable and recycled bags each year, so we have the experience and expertise to help you select the size, shape, materials and style that will best fit your brand and your customer’s needs. Working with us means you are working directly with the factory, so we are able to give you amazingly low prices and exceptional quality. We also offer full color printing on all sides of a bag for a cohesive look that perfectly showcases your brand. A wide array of materials like non-woven polypropylene, bamboo, jute, RPET, recycled paper and more let you zero in on what you like, what best fits your company’s environmental mission and how your customers will use the bag. Some materials can also be laminated and you can select a matte, gloss or metallic finish. Additional add-ons, such as zippers, pockets, grommets, handle length and more allow you to create something unique, stylish and functional. There are plenty of photos in our catalog that show you what we can do to help you visualize the different options available. While you flip through, jot down notes about what sizes and shapes and styles you like to help give you an idea of what you want to work into your custom reusable bag. Also be sure to check out the artwork specifications page to learn about the file formats we accept, layout requirements and the other ins and outs of designing your bag, so we can get started right away. As always please get in touch if you have any questions or if you would like a quote and we’ll help you out and get started creating your completely customized reusable bags. To peruse the digital catalog click here. Next Next post: Do Single Use Plastic Bags get a Bad Rap?